Happy Black Friday! It’s sale time at the ghee main store! This weekend every BLACK item in store is HALF PRICE – gowns, dresses, separates, shoes, boots, bags, hats, tights, thermals, manicures – if it’s black, it’s on sale for this weekend only at a 50% discount! There’s never been a better time to grab yourself a great bargain! This is your last chance to find the 27 coordinating pieces for only 10L each hidden in golden leaves around the ghee store and sim! After Sunday they will be gone forever! Want to be a ghee vendor model? Join the GHEE GROUP for further information on this awesome contest! We have some very exciting news: Ghee has been nominated for multiple Avi Choice Awards!! We are both thrilled and honored and are so very thankful for your support. We have the best customers ever! Keep up to date with ghee news, and enjoy the perks of VIP Group membership. VIP members receive an exclusive gift every month, advance information about sales and special offers, and other rewards are being planned! Copy and paste this link into local chat to join the group. Thank you for being a part of what makes ghee great! YOU! A brand new exciting round has begun for SNEAK PEEK! 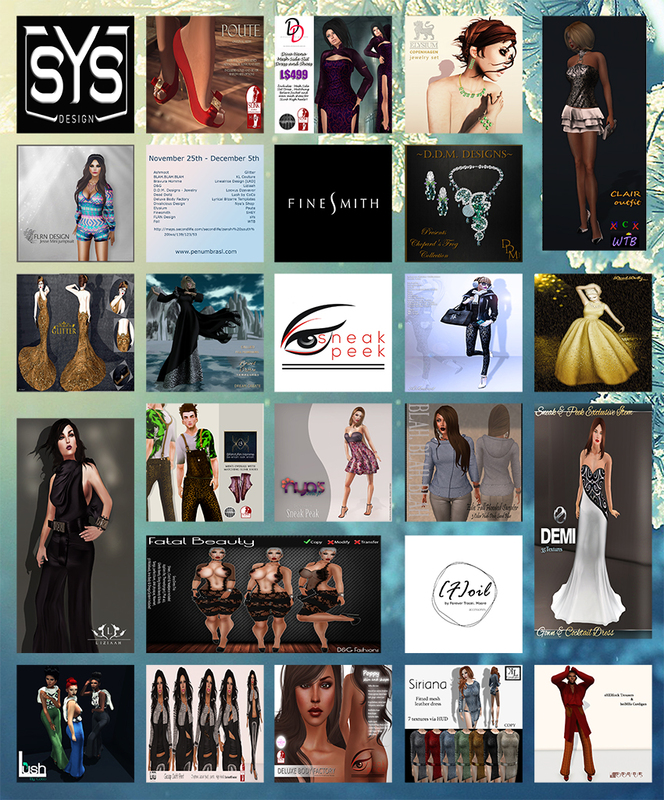 The very talented, amazing, designers have created clothing, that you must, as a linden conscious Fashionista, add to your winter wardrobe! Are you taking a cruise upon the MS Enchanted, stalking an exotic SL beach, or just hanging out, you will be gloriously casual glam in [FLRN] Jesse Mini jumpsuit Colors III. This long sleeve, jumper style mini jumpsuit, has a kaleidoscope of multi-print textures combined to make this awesomely bold and striking fabric! The jumpsuit has a front V-neck bodice and even deeper v shaped back. The neckline edge and sleeve caps are accented in a deeper shade of blue, pulled from the print! The shorts are a length that will make even the dancing daughter, of Duck Dynasty’s fame, happy to wear! Make sure you come down and pick up this, fun to wear, Jesse Jumpsuit by [FLRN] and check out the many exclusive and sophisticated designs, that are to be found at SNEAK PEEK, where the focused on luxurious and affordable style will put you, on everyone’s best dressed list and not break the bank! It’s Fall almost Winter and its all new round for SNEAK PEEK. Out talented designers have come together with exclusive and sophisticated pieces focused on luxurious and affordable style that will put YOU, on the fashion forefront!! The event runs from Nov 25th to December 5th. 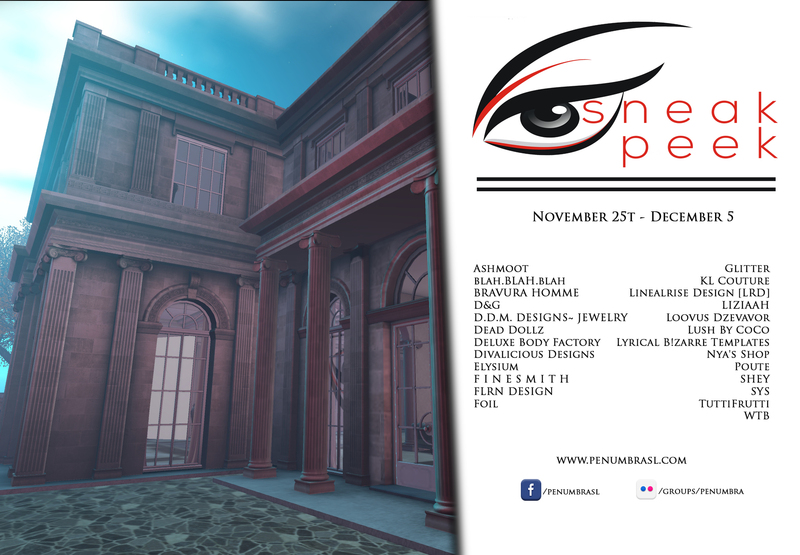 Make sure to take a Chic SNEAK PEEK! 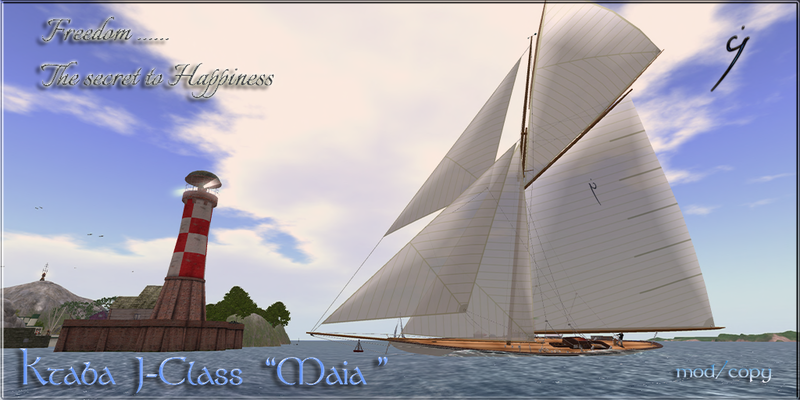 Today is the launch of the Maia, which will be held at 1:00 pm slt, on Sat., 8 November at Eden Tern. There will be a party, and inaugural races after the launch, gifts, and a general, all-around good time. Come on out for a great event and time! I believe sailors will be quite pleased with Maia, as she is an improvement on her already-excellent sister ship, Vanya. Some new things you will find on Maia are: raise & lower sails individually, “balance” of the ship responds to which sails are raised, manual or auto-rudder, improved seating machine, more efficient/ less laggy algorithms. One of the more positive reports I received from my beta testers involved a recent race of large boats, in a very laggy Blake Sea, where two Ktaba J-Class yachts finished a race in which every other boat crashed, and two J-Class and one OP60 finished in another race where every other boat crashed – and these were boats that did not have the reduced-lag algorithms I just mentioned above. Sailors will be happy to know that all these improvements will be migrated back to Vanya, in an update that will follow shortly after Maia’s launch. I hope to see you at the launch Party!